Build a knowledge repository consisting of product documentation; lessons learnt based on the project experience; Proof of Concepts developed for gaining the product knowledge; various artifacts developed for the project using Accela product such as test documents, analysis and design documents, and process documents and so on. RAD also gained experience in other support services that are needed along with the features that Accela Product provides. The Accela Automation(AA) offers powerful features that enhance the way end-users interact with State agency data. It has a Powerful Workflow engine that is configured based on an agency’s existing practices. Workflows can be complex, involving several departments and multiple steps. Or, workflows can simple, involving one department and a few steps. In addition, features like Robust Reporting framework, Fee and Cashier Management, Electronic Document Review, Scripting,SmartChartsmakeAccela a great product. Interface development – For Accela Automation to be able to have bi-directional communication with the other agency systems, it is necessary to build interfaces of different types using J2EE / .NET and with the help of API’s exposed by Accela and Other Systems. RAD team has developed expertise in this area by developing various interfaces between Accela and Agency Systems. RAD has a good understanding on the APIs and function libraries exposed by the Accela Automation. Data Migration – As Accela Automation replaces and existing systems, it becomes mandatory to migrate the Agency Data to the Accela based application, so that the existing users can continue to use the new system. Data Migration can be a tedious process as it involves migrating data from Legacy environment, which brings its own complexities. RAD team has worked on migrating data from such environments to the Accela Automation and hence gained sound experience in this area. Testing Services – One the Application is build, it needs to be tested to make sure that the functional requirements are met. In addition, there could be other types of testing involved such as Performance Testing, Automation testing, Regression Testing and so on. RAD team had the opportunity to work on such projects and provide end-to-end testing services. 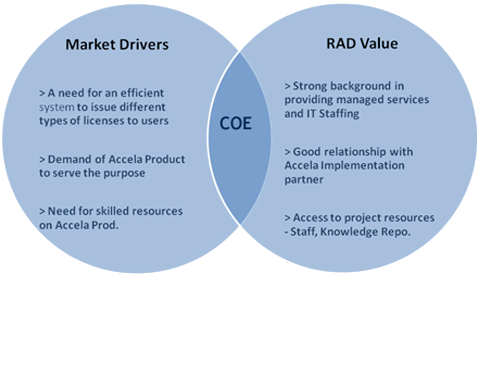 As a result, RAD team has gained substantial functional knowledge on the Accela Automation as well as the Domain knowledge on various License Types and related workflow.